Regular readers know that when there is a lacuna, there is inevitably a health reason behind it. This gap is a combination of having to wear several hats at once to help our parish over a bump to its new peaceful life under Father Brian Escobedo, and a bunch of health problems that clobbered my system over the past months. So, I have not been writing for my eparchy, the mission society, or here, so don’t feel bad – a lot has suffered! I am going to cheat a bit on this return and put in the Wall Street Journal’s fine article on the situation for Christians in Egypt. 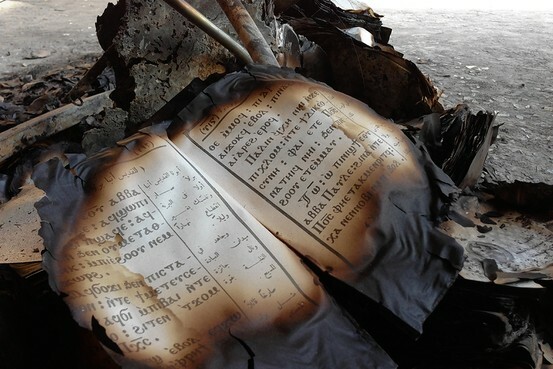 In one day, jihadists burned or attacked a combination of over 65 churches, convents, monasteries, schools, and clinics (the latter two always serve Muslims as well as Christians). The article below points out that some local Muslims come to the rescue – the problems seem be to the failure of security forces to even try to respond in a decent amount of time to either local Muslim assaults or those from outsider Brotherhood and Salfi extremists. T Salafi despise Christians, the Brotherhood seems to be a mixed bag of fanatics and moderates – which is why its candidates won last year. But what is happening now harkens back to the bad dark days of persecution in pre-British Egypt. Read on, and hopefully there will be more from me anon. And in the meantime, pray for the Christians – Catholic, Orthodox and Oriental Orthodox, Protestant, Anglican – throughout the Fertile Crescent of the Near East from Egypt to Iraq and Iran, who all face such trying times as not seen since the massacres of 1915-1919 when millions died from Istanbul to the deserts of Iran. MINYA, Egypt—Osama Makram Amin woke to the sound of gunfire, looked out his window and saw what he says were young men throwing gasoline bombs at the nearby Coptic Christian church. Earlier that morning, security forces in Cairo had attacked two predominantly Islamist sit-ins, leaving hundreds dead. Now, hours later on Aug. 14, attackers in this Upper Egyptian city were embarking on a day of burning and looting that would target 14 Christian churches, homes and businesses. It was the work of Islamists enraged by the Cairo crackdown, said police and many Christian residents. Matt Bradley/The Wall Street Journal A book found at a burned Coptic Christian church in Minya, Egypt. For Egypt’s interim government, the attacks on churches in Minya and elsewhere are proof of the dangers posed by the Muslim Brotherhood, whose protests against President Mohammad Morsi’s ouster last month have been met with deadly police force. The government has become a full-throated defender of Christians, calling them victims of Brotherhood “terrorism” and frequently citing damage against churches as it continues its drive against the Islamist group. 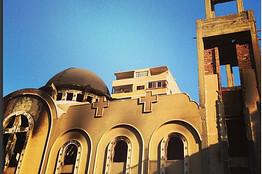 Morsi supporters are attacking Christian churches, but some Coptic Christian leaders say they are just as unwelcome with the new military regime. Former President Pervez Musharraf was charged with the killing of Benazir Bhutto. Read Matt Bradley’s account from Minya, Egypt, see his Instagram photos of the damage. 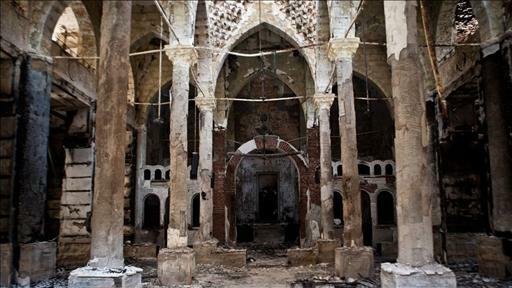 Matt Bradley/The Wall Street Journal Ruins of Bishop Moussa Church in Minya. But in this sun-starched town, a four-hour drive up the Nile River from the capital, Christian residents say they feel not so much embraced by the government as used. Throughout Minya’s daylong attacks, which also hit Christian-owned businesses and a nursery school, security forces were nowhere to be seen, several people here said. In the days after, no suspects appear to have been brought in, they said, as looting of the churches has continued. Mr. Amin, a Christian who lives in a predominantly Muslim neighborhood, said that as the local Bishop Moussa Church was under siege, he made several fruitless calls to the police. With no response from the fire station a few blocks away, either, he said, he and his neighbors put out fires with a garden hose. Asked about the official response, he laughed. For many Christians here, the military-backed government’s new embrace recalls the decades under strongman Hosni Mubarak: Mr. Mubarak’s government spoke loudly about the Christian cause on the international stage, they say, while his security apparatus shied away from prosecuting those who terrorized Coptic communities. Though Christians here were among the strongest opponents of the Islamist-backed Mr. Morsi—a motivation often cited for the current attacks against them—many see little reason to cheer the latest government to take up their cause. Egypt’s Ministry of Foreign Affairs distributed handouts to foreign journalists listing the 35 churches nationwide it said were attacked on Aug. 14. The army has extended several invitations to fly journalists to Minya to survey the damage. “The government is trying to use the Christians in Egypt to justify their attacks on the Muslim Brotherhood,” said Bishop Makarias, the head of Minya governorate’s Coptic community. “They’re trying to use this to pressure the Western Christians” to support the military-backed government. The government denied that. “This is, frankly speaking, not true at all,” said Badr Abdel Atty, a spokesman for the Ministry of Foreign Affairs, who blamed the Brotherhood and other Islamists for systematically attacking churches as well as police stations and other public buildings in a bid to sow chaos. The governor of Minya, Gen. Salah El Din Ziyadah, acknowledged the lack of police response in last week’s attacks but said the security forces were themselves fighting off Islamist attacks on police stations and even the fire department. While he said security concerns have delayed a probe into the attacks, he is certain that the Muslim Brotherhood is behind them. Brotherhood leaders have repeatedly condemned the church attacks and denied having any role in them. The culprits, they say, are people contracted by the police to justify a crackdown on Islamists, an allegation repeated by many Muslims in Minya. “Those thugs are the ones who have been supported by the police for decades,” said Khaled Elkomi, a Muslim Brotherhood member in Minya. Egypt’s Coptic Christian minority makes up about 10% to 15% of the country’s 93 million-person population. For the most part, Christians are distributed evenly throughout Egypt, and integrated into every community and societal layer. A large number of wealthy Christians were thought to have fled Egypt under Mr. Morsi’s yearlong rule. The highest concentration of Christians are in the cities and villages of Upper Egypt. In Minya’s governate, Bishop Makarias said, Christians make up about 35% of the population, the highest in Egypt. 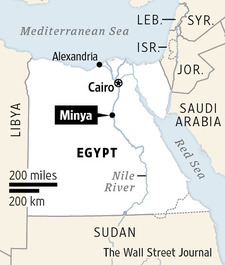 Coptic Christians here live alongside a large population of hard-line Islamists: Minya is also a heartland of Salafi Muslims, in addition to members of the Muslim Brotherhood. Signs of trouble in Minya emerged shortly after Mr. Morsi’s July 3 overthrow, residents said during an independently arranged visit. Violence between a Christian and Muslim youth mushroomed into rioting and vandalism of Christian homes and businesses, Bishop Makarias said. Imams in two hard-line mosques near the church’s headquarters made anti-Christian statements during Friday prayers, the bishop said. Owners of businesses throughout downtown Minya also found their properties marked with large X’s—red for Christian-owned stores, black for those owned by Muslims. Christian business owners say they were terrified. At about 10 a.m. on Aug. 14, Mr. Amin said he awoke to the din of clashes outside. When he looked out his window, he saw a dozen or more youths, some with covered faces, firing homemade handguns and Molotov cocktails at Bishop Moussa Church. Christian and Muslim neighbors rushed to the scene to chase the young men away and put out the fires, he said. The youths came back an hour later, this time attacking from the building’s rear. Hours later, a Christian police officer arrived alone, Mr. Amin said. With the assailants still in view, he said, the officer took the head priest’s phone number and told him to call if anything more happened. “He said he was defying orders by showing up, and he only came because he was a Christian,” Mr. Amin said. As the day went on, the crowds grew. By around 10 p.m., Mr. Amin said, hundreds of masked men were attacking the church. As it began to burn in earnest, attackers made off with expensive carpets, air-conditioning units and jeweled votive items, he said, in an account corroborated by other locals. “The police response, by all accounts, was that there was no police response,” said Adam Coogle, a researcher for the New York-based advocacy group Human Rights Watch, who was in Minya this week compiling a report on sectarian violence. He said four people were killed in attacks on what he said were more than 35 churches nationwide. At least four people have been detained and charged with committing sectarian violence in the coastal city of Suez, he said. Minya’s Christian residents and church officials said police investigators still haven’t shown up to take stock of the damage. Gen. Ziyadah said full-fledged investigations have been delayed by the lingering threat of violence. The governorate’s security office is awaiting delivery of bulletproof cars from Cairo, he said. Arrests have been made, he said, declining to elaborate. 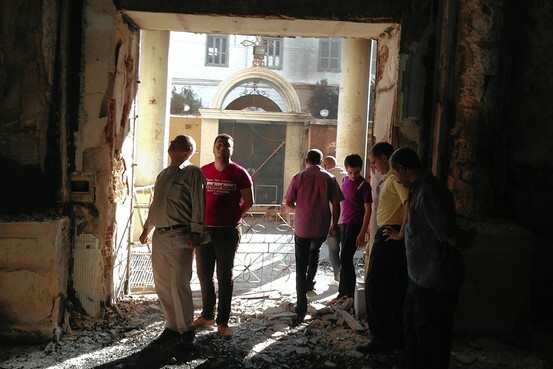 Meanwhile, church officials said looters could be seen days later carrying items from Minya’s burned churches.